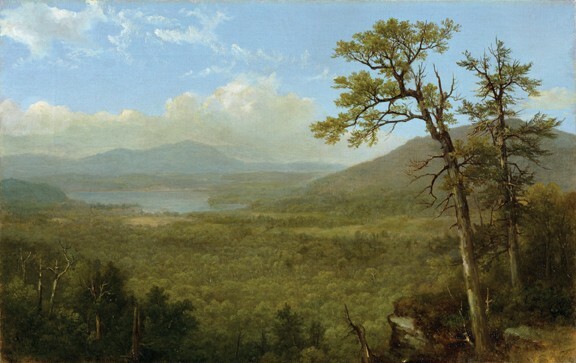 Asher Brown Durandâ€™s Adirondack Mountains, NY, (1870), part of â€œthe Hudson River to Niagara Fallsâ€ exhibition at the Dorsky Museum. Hudson River landscape painting is the first genuinely American art; it was certainly among the most ambitious painting being done in the United States in the 1800s. Many of the painters were natives of the region—George Inness was born in Newburgh. Asher B. Durand’s native Jefferson Village is today’s suburban Maplewood, New Jersey; his protégées Thomas H. Hotchkiss and Jervis McEntee grew up in Coxsackie and Kingston, respectively. The English-born Thomas Cole went first to New York, then left to settle permanently in Catskill. The feeling these artists had for the river and the region is conveyed through canvases depicting dramatic skies reflected in shimmering waters, surrounded by idyllic pastures. While these picturesque vistas offer us a glimpse at a seemingly unspoiled Hudson River, they were almost always enhanced by a pictorial idealism derived from the conventions of European landscape painting. Indeed, the Arcadian idyll these canvases present was already beginning to vanish as industry and trade developed throughout the century—which is, perhaps, precisely why they chose to paint it. Conventions typical of this painting include the wedge of land in the foreground on which clusters of animals, people (or both) are arranged, functioning as surrogates for the viewer, enjoying the vista spread before them (as we imagine we were). The framing edge of the picture is almost always reiterated by tall trees traversing the plane on either side. Dramatic skies provide light and color; sailboats, movement. An exceptional and somewhat less conventional work by Francis Augustus Silva from 1870, Off City Island, New York is an almost minimalist depiction of a large sailboat surrounded by smaller schooners floating in the relative stillness of New York Harbor. This shimmering canvas glows with gradations of light and color. 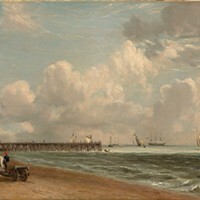 Sails, trees, and a single red brick building provide a kind of melodic line modulated by the tonal atmosphere, the sharpness of their edges dissolving in the distance. A charming and delicately rendered winter scene by Andrew Fisher Brunner, Cutting Ice, Rockland Lake, NY from around 1890 offers a glimpse of a once vital and now obsolete industry, the cutting of ice in winter to be stored in icehouses throughout the year. A frieze (no pun intended) of figures extracts slabs of ice from the frozen lake, the gloomy gray winter day punctuated only by a small red building and smokestack. Also unusual is Thomas Cole’s Study for “Dream of Arcadia” of 1838, a tricky little trompe l’oeil painting-of-a-painting that was itself a study for a much larger work. 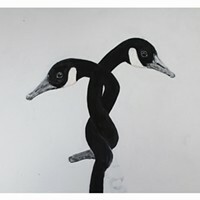 The oil-on-canvas study that is the subject of the picture appears tacked upon a wooden board conjured in paint. If you didn’t know better, it could make you think Cole was a postmodernist. Accompanying the exhibition of landscapes is Greg Miller’s “Panorama of the Hudson River.” Cleverly installed, two continuous strips of photographic prints mounted on a steel support suspended from the ceiling snake in tandem though the gallery. As you walk between them, each panel offers a continuous series of views of both banks of the Hudson from the southern tip of Manhattan to Albany. Reproduced below Miller’s piece is the project that inspired it, a 1910 photographic survey of the Hudson made by G. Willard Shear, versions of which were sold as souvenirs on the Hudson River Day Liners, grand steamships that offered pleasure cruises between New York and upriver ports from 1863 and 1948. Viewing the two projects together has the effect of compressing history. One marvels at how much—and often, how little—our region has appears to have changed in the intervening century. “Hudson River to Niagara Falls: 19th-Century American Landscape Paintings from the New York Historical Society” and “Panorama of the Hudson River: Greg Miller” are being exhibited through December 13 at the Samuel Dorsky Museum of Art at SUNY New Paltz. (845) 257-3844; www.newpaltz.edu/museum.